With all the heavy rain we have had over the last two weeks, all the rivers have been high. Joseph Creek went from around 100 cfs to nearly 700 cfs. Other rivers in northeast Oregon were the same story. 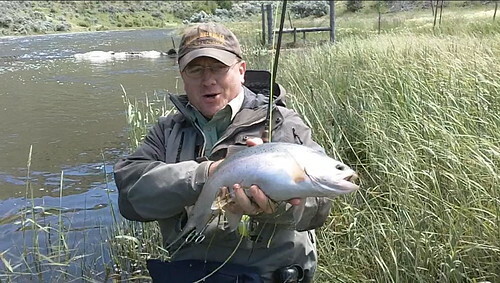 After staying home one weekend I thought the Powder River might provide a fishable alternative. The USGS does not have a gauging station on the Powder, but I guessed that the river would not be as affected by the recent rains since it was a tailwater. I called Jeff and told him I had a great adventure for us to go on. We could take my pontoon boats and float the Wild and Scenic River section of the Powder River from below Thief Valley Reservoir to where Big Creek runs in 10 or so miles downstream. We had both fished below the reservoir and wanted to see what the upper, hard to reach, BLM sections had to offer. There is roughly 10 miles of BLM ground below the reservoir, but you can’t access it from the north end because of private property. You can access it from a dirt road on the south end and I had done just that a month or so earlier. The opening weekend of Southeast Oregon fishing is April 24 and I had hiked much of this section of the river. My wife and I had hiked from Big Creek upstream about 4 miles. The river looked quite pleasant for a float. As I walked up the canyon that weekend I made a mental note of an especially rapid section of the river that I thought looked a bit treacherous if someone were going to try and float the river. Other than that I thought the only drawback to floating the river would be the spots where you might have to stand up and drag the pontoon boats through water that was too shallow to float. Our basic plan was to leave Friday morning with two vehicles. We would take my Jeep Cherokee and leave it as close to the river as we could get near Big Creek. We would then take my pickup with the pontoon boats and put in below the reservoir. We were going to spend Friday fishing below the dam and sometime in the afternoon float downstream to a ¼ mile section of BLM ground that was in the middle of private ground. Here we would camp and spend part of Saturday fishing. We would then make our way downstream fishing the BLM ground where we wanted. I assumed that we would not make very good time floating since the river is fairly small and we would have to drag the boats around protruding rocks and shallows. We would have plenty of time to make it out by Sunday when our wives were expecting us home. That was the plan. Plans never quite seem to work out, do they. Driving down the freeway along the Powder River Jeff and I both noticed that the river looked about as high as either of us had ever seen. This section of the river was upstream from Thief Valley Reservoir, so we assumed the flows below the dam would be less. We made our way up the Medical Springs highway and up the dirt road that leads to the BLM ground. We even found a dirt road that leads right down to the river. But the river . . . Holy Crap! There was a lot of water. I looked at the positive side. “This will just make it easier to float the river. We probably wont have to drag the boats around much of anything,” I told Jeff. We left the Jeep there and headed for the reservoir. When we arrived at the reservoir I had a hard time not saying Holy Crap! Over and over again. There was a lot of water! We packed the pontoon boats down to the river and made a second trip for our dry bags and fishing gear. The three other times I had been there, it was quite easy to wade the river. If you wanted to cross the river this day, you were going to do it swimming or in a boat. We had boats so we paddled across. It was a tough day of fishing. The wind was relentless and second cast out my fly line broke. I had put a nick in it last year and it finally gave out. I often take a second line and reel, but I had too many other things to remember to take this weekend to remember an extra reel and line. I tied the line in a square knot and had to keep my casts under 30 feet or so. With the wind pounding us that was about all the longer you could make successful casts anyway. I did lose a couple good fish when they made runs and the knot in my fly line caught on the guide. There were not any hatches on the river or the lake and the fish did not seem to be feeding actively like they had on the other trips I had made. Jeff and I both managed to catch quite a few fat fish, but you had to work at it more than usual and they did not seem to be keying in on any particular fly. But when you did hook one watch out. Those fish are fat and full of life. I had fish come out of the water up to five times. Sometime around four o’clock we decided we had fought the wind enough and would head down the river and find a good place to pitch a tent for the night. We launched the pontoon boats and enjoyed a short float down to the first section of BLM ground. The property boundary is not marked, but I had drawn the property boundaries from my BLM maps onto my mapping program and downloaded it onto my GPS. We landed the boats and found a great place for a campsite on the BLM ground. It was still pretty early so we got out the rods and fished a little. With the water flows as high as they were it was difficult to find water that wasn’t too fast. Jeff and I began to drift our flies and I swung a woolly bugger in front of a big rock. The end of my swing was about ten feet in front of Jeff and the water just exploded. I let out a whoop and almost simultaneously a fish took Jeff’s fly at the bottom of his swing. The exploding water at the end of my line disappeared with my fly. Jeff proceeded to tell me that was probably the biggest rainbow I would ever see. “The biggest rainbow you will ever see you mean. All I saw was exploding water,” I told him. I was using good quality 2X tippet. After fishing a bit longer we decided we would go ahead and float down to where the BLM ground runs continuous to Big Creek. It was a great float for a while. The river was easy to float and we both got out our rods and fished as we floated along. 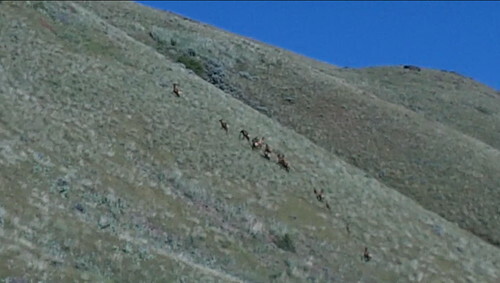 We saw at least five small herds of elk cows and calves on the drift down and I found it challenging to hold my rod, video tape the elk, and keep the boat from running into things all at the same time. Jeff caught a fish on the float and it was quite entertaining to watch him try to steer his boat and land a fish. We were on the lookout for a good camping spot when the character of the river changed dramatically. All of a sudden we weren’t gliding along peacefully. The water got fast in a hurry and started to get rough. I tried to row to the bank several times with no success. Whether I liked it or not I was in for a ride. Let me just say I am an absolute novice when it comes to floating rivers. I have had almost no boating experience. 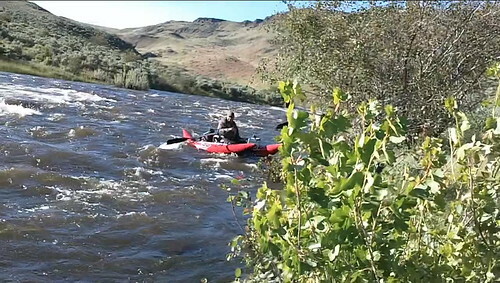 My first time floating anything was floating the S. Fork of the Walla Walla last year. I tried it again a week later only to tear a hole in one of the pontoon boats. After that I decided a better built pontoon boat was in order and found two used Buck’s Bags boats. Jeff and I floated the roadless section of the Imnaha River below Dug Bar Road last year for Steelhead. That has been the extent of my boating experience and I don’t think Jeff has had a lot more. Again let me remind you that I thought the extent of our difficulties floating the Powder River would be shallow or protruding rocks that we would simply have to drag the boats around. This was not the case. The waves were big and were scaring the crap out of me when they were at eye level. I got good and soaked as well. I had a raincoat on, but did not have time to zip it up when we got into the rapids. Wave after wave began splashing down the top of my waders. After a mile or two of rapids (I am not real sure how long this section of river was, but it seemed really long to me) the river finally smoothed out a little and I was able to row the boat to shore. Jeff and I had a big laugh at how unexpected that was and how scared both of us were. We had made it a long ways down the river and we now only had 4 or 5 miles to go to the Jeep. Jeff suggested that we might as well float all the way to the Jeep that night since we had made it that far. He also suggested that we do it again the next day, but we should figure out a way to strap the video cameras on the next time so we could record the rapids. I thought that sounded pretty good since we had survived the first run. I knew there was still one more bad section of river and I found it on my GPS before we launched the boats again. The next mile or two of water was nice again and I continually looked at my GPS so I could make sure we landed the boats in time and could portage around if necessary. And it looked bad. Neither Jeff nor I wanted to attempt the corner. It looked extremely scary with a huge car sized boulder that looked like it would eat pontoon boats for fun. The really scary part was only a few hundred feet long. Below it was rapids, but it looked easy compared to some of the stuff we had already ran. Our options for portaging were straight up the canyon, very steep and quite a ways down stream before you could easily make it back to the river. Or we could try to find our way through a mess of flooded brushy bank. I thought we could kind of push our pontoon boats and wade/float behind them on these side channels. Jeff didn’t volunteer to go first so I did. The flooded banks were surprisingly deep and I often couldn’t touch the bottom. As I made my way around a large clump of small trees the water went into a small rapid section and sucked me and the pontoon boat down it fast. I am not sure exactly how it happened, but it had me pinned beneath the pontoon boat against a rock. I yelled at Jeff not to follow and worked to get free from the boulder. Once I freed myself and the boat from the first boulder, the boat and I went down the chute and after banging my shins a few times we were pinned again. A second time I got free and again I went down the chute. It didn’t pin me down anymore, but it gave me a good beating. It banged me against several more boulders and drug me head first through brush. I finally came out the ringer on the other side into a small pool. I pulled my boat up on the dirt and let loose a good string of cussing. I struggled back upstream through the brush and water to help Jeff find a different way through. We picked a different way through the brush and Jeff and I had to pack his pontoon boat sideways to get it through the brush. After beating a path through heavy brush we made it back to the river and put in. The rest of the float down to the Jeep was fairly uneventful. For my part, I was soaking wet and felt like I had come out on the losing end of a fight. I was extremely happy to see my Jeep. After pulling the boats up to the jeep I pulled my dry bag off the back of the pontoon to inspect for dryness. I had a feeling that the contents might not be dry after getting it pinned under the water a couple of times. I also didn’t get as many rolls on the bag as I would have liked due to the long tent I had in the bag. My “dry” clothes were wet. My sleeping bag was wet and the clothes I was wearing were wet. I had planned on putting an extra set of clothes in the Jeep “just in case” but had forgot to do so. Our enthusiasm had suffered some blows since an hour or two earlier when we were talking about doing it all again the next day. Now it was 8:30 at night and I was wet and beginning to get a bit cold. Both Jeff and I thought a warm motel room and a real bed didn’t sounds half bad so we headed to Baker City. Little did we know the Hells Canyon Motorcycle rally was this weekend as well. The town was full of Harley’s and other kinds of motorcycles all trying to make their exhaust blow your eardrums as they went down the road. Our thoughts turned from getting to dinner to making sure we could find a bed to sleep in. After stopping at several motels we finally found one with a freshly cancelled reservation. The next day our enthusiasm for doing a second float trip was completely gone. We were both wore out. We decided we would do a nice easy day of fishing the Powder River below the dam. The wind blew even harder on Saturday and casting was even more difficult than the day before. We stuck it out most of the day and fished until early afternoon, our fishing interrupted only by a short nap in the shade of the one tree down there. We had carried the pontoon boats down to the river again so we could get across. Casting would have been nearly impossible on the other side with the wind blowing so hard. After packing the pontoon boats back up the hill to the pickup we headed to North Powder for an early dinner and a Hungry Man omelet. If you like omelets and are near North Powder, make sure you stop at the café. We decided on the way home we would go over Tollgate instead of taking the freeway over Cabbage. We wanted to see where the snow was on the road to Jubilee Lake. After going through La Grande my pickup sputtered and died like it had ran out of fuel. I had just switched tanks and had one full tank of diesel still. My mind went racing through what the problem could be. After a few phone calls and running around La Grande trying to find a parts store that was still open at 6:45 p.m. we ended going to the local Wal-Mart and buying a set of fuses. Someone I knew had a fuse that was labeled “trailer battery charge” go out in his pickup within the last month and that killed the fuel to his pickup. Luckily for me, he was unlucky before me. Otherwise I would have never thought to check a fuse labeled “trailer battery charge.” After a few minutes of cranking and getting fuel worked back through the system the pickup was running and we were on the road again. We took the side route we had planned and were happy to see that we could make it past all the snow on the way to the Wenaha. There is still some snow left to melt off so it will probably be another two weeks I am guessing before the Wenaha is wadeable. Now that I am home I thought it would be really valuable to find a site that listed the streamflow for the Powder River. So here it is http://www.usbr.gov/pn-bin/rtindex.pl?cfg=powder It is a Bureau of Reclamation site and has historical data as well as current flows. 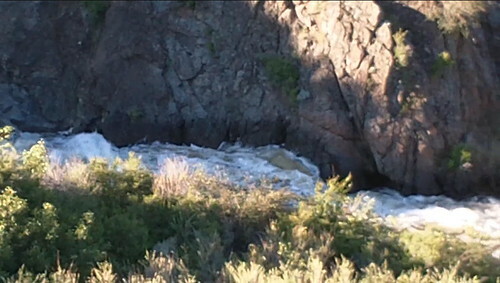 When we floated it on Friday the flow was around 1300 cfs. The other times that I fished it the river was between 150 cfs and 250 cfs. For floating, I imagine the higher flows would be better, but I will leave that judgment to those that know something about floating a river. For me, my main objective is fishing so I would prefer a more normal flow so that the fishing was better even if it means having to drag the boat around a lot of stuff. If you want to find the road to the BLM section of ground, take the Medical Springs Highway (203). After you cross the Powder River look for an unmarked dirt road on the left that goes over a cattle guard. If you have to go through a closed gate you have the wrong road. If you follow the dirt road it will lead you down a draw to Big Creek. The first weekend I hiked the canyon I parked my Jeep at the top of the draw and walked along Big Creek down to the Powder River. The road down looked a bit rough and steep and the weekend I was there, if you tried to ford Big Creek you would have been washed downstream. The road going up the canyon on the other side of Big Creek looks pretty rough as well. This makes Big Creek the upper end of the road in my mind. From here it is all foot power if you want to explore upstream. From Big Creek to the reservoir is 9 river miles with 6.5 of those miles being continuous BLM ground. There are several miles of BLM ground below Big Creek as well. This entry was posted in Powder River. Bookmark the permalink.